Delta, a global provider in power and thermal management technologies and a pioneer in display solutions, showcasing its comprehensive portfolio of displays solutions for varied applications at InfoComm India 2018. Infocom India, one of the premier show catering to latest professional Audio Visual and Experiential Communications, will be held in Mumbai during 18-20 Sep. Delta’s showcases include advanced 4K Laser DLP® Video wall, fully supporting the 4K resolution, the 3rd Generation Distributed Vision Control System, DVCS®, the Fine Pitch LED Display and its Xtra narrow bezel LCD video wall with as low as 1.8mm bezel to bezel gap. One of the major feature of Delta’s showcases at the show is 216sqft 4K DLP® Laser Video Wall. The Video wall will be displayed paired with Delta’s DVCS® (Distributive Vision Control System). DVCS is a high-performance IP-based control system designed to fulfill the sophisticated needs of control room applications to ensure a perfect continuity of images across multiple cubes. DVCS® Gen. 3 is capable of handling 4K resolution input and output with 60 frames per second (fps) performance. This platform, which can manage multiple video sources on a single display, enlarge a single video signal to multiple displays or enable centralized control of several video walls, creates an unparalleled reliable, flexible and scalable display solution capable of fulfilling critical applications, such as utilities, surveillance, disaster control and traffic supervision. The state-of-the-art Delta 4K Laser Video wall solution features an xtra slim form factor, 560mm-depth, an unmatched 4K (3840 x 2160) resolution, a high brightness of 4,000 lumens and a brightness uniformity greater than 95 percent. Its built-in Intelli-Sense function monitors the various parameters of the system and automatically performs real-time adjustments for 24x7 operations. The Laser Video Wall is leading in the industry to offer a certified IP6X protection rating and an optical sealed engine for up to 100,000 hours of worry-free operation. Delta’s latest Xtra-narrow bezel LCD video wall offers Full HD Resolution. The LCDs possess an exceptional brightness of 700 nits (55-inch cubes) and a minimum 1.8mm combined bezel width. With Full HD display, these LED-LCD video walls allow a seamless connection between each display, creating a powerful, high-impact visual experience for viewers. The indoor Fine Pitch LED Displays of 1.5mm pixel pitch showcased in a larger-than-life size, takes Delta’s display solutions to the next level. With high contrast, high refresh rate, fast response time and a high motion rate, the Fine Pitch LED offers a true-to-life display. With advantages including low power consumption, longevity, seamless integration, compactness, energy efficiency and ultra-high resolution, this LED Display is suitable for large conference centers, cinemas, transportation and retail applications. State-of-the-art projectors from Vivitek, a brand of Delta, are a part of the showcase at show offering highly advanced and versatile display technologies such as edge-blending imaging for large venue applications, Ultra-short throw projection for corporate & education applications and 4K interactive flat panel display (NovoTouch) with its Novo Collaborative series for complete collaborative solution. Delta Displays, a division of Delta, is a pioneer in developing professional displays for control rooms in surveillance, security, traffic, command & control, utilities, process control, telecom and broadcast applications. 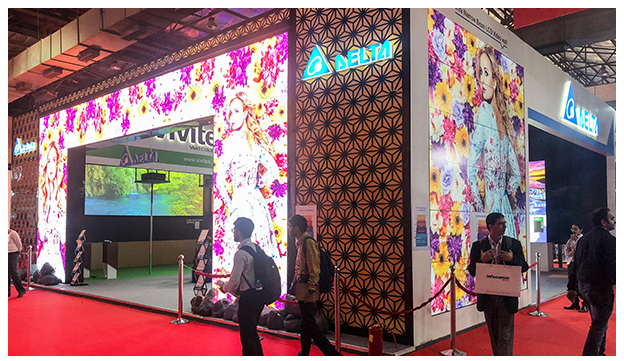 Delta offers a wide array of display technologies including: rear projection 4K and Full HD Laser DLP® video walls, LED-DLP® Video walls, Xtra thin-bezel LCD video walls, and high-resolution indoor/outdoor LED displays with a powerful & highly flexible Wall management Software suite. Delta Electronics India, operating in since 2003, is a leading Power and Energy management company and is a 100% subsidiary of Delta Electronics (Thailand) PCL. Delta Electronics India operates in three business categories: Power Electronics, Automation and Infrastructure. Delta Electronics India has a legacy of operating in India with market leadership in Telecom Power Solutions, Renewable Energy Solutions (Solar Inverters) and Display Solutions. It is also a leading provider of Industrial Automation Solutions, UPS & Datacenter Solutions, EV Charging Solutions, Rail Transportation Solutions, Energy Storage Solutions, DC Fans & Blowers, and Components. With twelve regional offices, three manufacturing facilities (Rudrapur, Gurgaon and Hosur) and two R&D centres (Gurgaon and Bengaluru), Delta Electronics has a strong presence across India with more than 200 channel partners.